Book Review Who are you really and what do you want ? 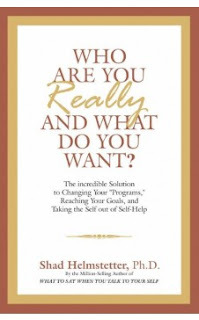 Who are you really and what do you want ? is a self help book written by Dr. Shad Helmstetter. Once again, the jazzy title of the book attracted me to read the book; but I wasn't disappointed. It's a light read written in simple language without much beating around the bush. This book don't directly talk about finding your passion, being positive etc; but indirectly tries to convey the same message. The core aspect the author tries to bring forward is that we can achieve our dreams through proper goal setting and with the help of a coach. 1. Fine tuning our self talk. Understanding how our own sub conscious self talk is affecting us - positively or negatively. One third of the book is devoted on how to listen actively to our self talk, how to make it productive/positive to ourselves and do away with negative thoughts. This step is considered as the foundation step to understand what you want and how to achieve them. What I really liked is that some of the ideas he mention like the questionnaire to find out where we stand, writing down what we self-think, trying to reword or counter the negative self talk etc. If you have read Prof.Sreekumar Rao's Are You Ready to Succeed; this is similar to the mental models he talks about. 2. Active goal setting. Second part of the book is devoted to making goal setting the right way. I believe the discussion points are standard ones that you may see in other goal setting literature. Having said that, if you are actively thinking about improving your goal setting; this book would be the only one required. Some of the points, author stresses are - writing down the goals, putting time lines, obstacles etc. He has put out a good framework of eight steps to identify if the goal is the right one. The author also provide a list of ten areas and sample goals in each for the reader to consider taking up. 3. Finding a mentor or coach. The last part of the book emphasize on the importance of professional coaching and finding the right mentor. While reading this part, I felt it more marketing coaching services; but in a way I agree that having a buddy, mentor or coach helps in fine tuning our path and achieve the goals - be it personal or professional. I really liked the questions he provides in this part as those which may come from a coach.